Weekly Indicators for October 2 - 6 at XE.com. The slew of positive trends continues. September jobs report: establishment survey stinks, but household survey rocks! Manufacturing jobs fell by -1,000 for an average of +9,800 a month vs. the last seven years of Obama's presidency in which an average of 10,300 manufacturing jobs were added each month. July was revised downward by -51,000. August was revised upward by +13,000, for a net change of -38,000. The more leading numbers in the report tell us about where the economy is likely to be a few months from now. These were mainly flat. construction jobs increased by +8,000. YoY construction jobs are up 184,000.
temporary jobs increased by +5,900. the number of people unemployed for 5 weeks or less increased by +4,000 from 2,222,000 to 2,226,000. The post-recession low was set al,ost two years ago at 2,095,000. Overtime was flat at 3.3 hours. Professional and business employment (generally higher- paying jobs) increased by +13,000 and is up +528,000 YoY. the index of aggregate payrolls rose by +0.5 from 134.7 to 135.2.
the alternate jobs number contained in the more volatile household survey increased by 906,000 (!) jobs. This represents an increase of 2,419,000 jobs YoY vs. 1,777,000 in the establishment survey. Government jobs rose by +7,000 . the overall employment to population ratio for all ages 16 and up rose +0.3% from 60.1% to 60.4 m/m and is up +0.6% YoY. The labor force participation rate rose +0.2% m/m and is up +0.2% YoY from 62.9% to 63.1%. This report was certainly affected by Hurricanes Harvey and Irma, but what is surprising is all of the areas of strength, especially in the household report. Both the U3 and U6 unemployment and underemployment rates fell to new lows for this expansion. Involuntary part-time employment also fell to a new low. Prime age labor force participation rose to a new high. Even in the establishment survey, but for the huge decline in leisure and hospitalityworkers, the headline number would have been +78,000. And the l eading category of temporary jobs increased. The only cautions to my surprisingly upbeat take on this report are that net revisions to July and August were lower, which has become increasingly common this year; and the household survey, which included a gain of over 900,000 jobs ( ! ) was likely something of an outlier. But despite the negative headline number of jobs, the totality of the two reports show an underlying strong labor market -- with of course the dismal and chronic exception of lackluster wage growth. I created that adjustment by backing out the affected states (NY and NJ) from the non-seasonally adjusted data, which gave me the number of initial claims filed in the other 48 states. I compared that with the same metric one year earlier, and multiplied by the seasonal adjustment to arrive at the number if the affected states had the same relative number of claims during the given week, as all of the unaffected states. This tells us whether or not the hurricane disruptions are masking any underlying weakness in the economy. This year I backed out Texas starting 3 weeks ago, and added Florida two weeks ago. This week I have added Puerto Rico. The state by state data is released with a one week delay. So what follows is the analysis for the week of September 23, the number for which was reported at 272,000. *The Department of Labor estimated the number of claims for Puerto Rico last week. In 2016 the weekly seasonal adjustment was 1.27. This year it was 1.26 Multiplying the non-seasonally adjusted total of 194,314 by 1.27 gives us 247,000. Multiplying by 1.26 gives us 245,000. Thus the hurricane-adjusted initial jobless claims number for the week of September 23, 2017 is 246,000. The four week hurricane adjusted average is 237,750. Just a quick note about two data releases this week, one of which was (apparently) whipsawed by the hurricanes, and the other (surprisingly) was not. (Note the FRED data, by contract, is delayed one month so does not yet show September). It's pretty clear these two months should be averaged to get a better idea of the trend, which is a little over 17 million units. Even so, that is an improvement from earlier this year. More importantly, it takes the notion of an immediate recession signal off the table. The ISM figure once again confirmed the strength shown in the regional Fed indexes, which surprisingly even included Texas. Even PMI's more tepid reading did not appear to be affected by the Texas and Florida hurricanes. 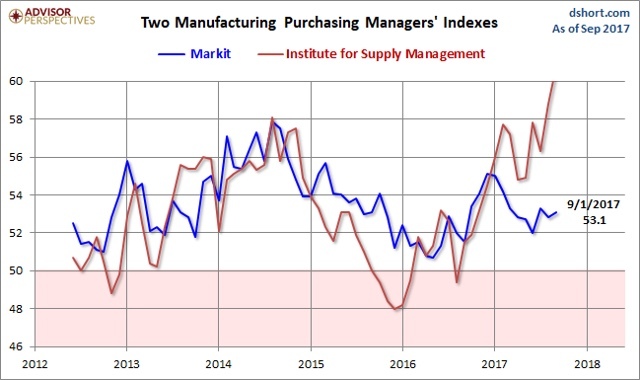 While the regional Fed indexes and ISM manufacturing have been running a little "hot" this year, they do generally correlate well with the manufacturing component of industrial production. The bottom line is that these are two short leading signals that the economy is doing very well. Is residential construction spending confirming the slowdown apparent in housing permits and new home sales? A few threads of the Trump malAdministration came rogether this past week. The latest attempt to overturn Obamacare confronted Trump with a choice between his two main goals: basking in a Trump triumph vs. erasing all of Obama's programs from the history books (in retaliation for Obama humiliating him at the White House correspondents' dinner in 2011). At the beginning of his presidency, Trump opposed the "repeal and run away" Congressional GOP objectives for Obamacare, telling them he wanted a "replacement" plan with more coverage and lower premiums. He wanted, in short, a Trump triumph. After 3 failures, however, Congress's 4th try at dismantling Obamacare has no replacement features. Things like guaranteed coverage of pre-existing conditions were stripped away. The bill in essence simply repealed Obamacare, punted the issue to the States with instructions to not even think about enacting something like universal coverage, and gutted Medicaid to boot. In short, it was very much "repeal and run away" (with a fig leaf). Trump's support for the bill showed that he will even eschew a Trump triumph if the alternative obliterates an Obama accomplishment. Another thread of the Trump presidency is its nearly constant failure on the test of basic decency and humanity. One of the places where it had been safe to avoid the rancid circus of Washington was The Weather Channel. Not this past week, where it more than any other media outlet highlighted the humanitarian crisis in Puerto Rico, which appears to be approaching Katrina x 10. When an outlet as innocuous as The Weather Channel feels compelled to implore Washington to DO SOMETHING! you know that those in power have plumbed a new low in the banality of evil. I have a feeling, however, that conditions in Puerto Rico are going to get much worse -- and maybe finally noticed by the actual news media -- before they get better. Why hasn't it sunk any lower? Paradoxically, Trump and the GOP are benefitting from the pretty decent Obama economy -- which is still in place, on autopilot, because the GOP has accomplished exactly zero legislatively on economic matters. And the ongoing Obama economy at the moment has a 4.4% unemployment rate, is still adding about 150,000 new jobs a month, has real median household income at its highest in a decade, if not forever, and real hourly wages for nonsupervisory workers at their highest in 4 decades. In short, civil society may be going to hell, but the economy? Not too shabby. Historically, in the absence of either war or civil unrest generating a real death toll that dominates the headlines (like Korea, Vietnam, or the race riots of the late 1960s), an economy with these numbers generates reasonably good numbers for the incumbent political party. The benefit of that -- of Obama's economy -- is currently going to the GOP! But if Trump's approval is in the 35%-40% range with a decent economy -- and the Congressional GOP polling at the worst ever -- just imagine what the polling is going to be like when the economy as it must ieventually turns down.